Teaching a cat not to be a predator is a daunting task. The instinct to chase, stalk, and ambush prey is inherited and found deep in the core of the genetic make up of a feline. A cat’s predatory instinct is linked to the cat’s survival skills, so we would not have cats today if they were not allowed to prey on small animals in order to survive. However, some owners may be disturbed when their furry feline friends present with a dead mouse in their mouth or worse, a dead bird. Years of domestication have not caused a cat to lose its survival skills. This is after all, a good thing because should your cat get lost or escape, it will know how to rely on its natural skills in order to survive. While some cats have a stronger predatory drive than others, if put outside to cater to themselves, there is no need to teach cats what to do in order to survive. Predatory drive today can be observed in both indoor and outdoor cats. In indoor cats, the absence of prey causes them to redirect their predatory instincts towards other sources such as chasing a ball of yarn or the owner’s feet. As cute as these forms of play can be, they ultimately are replacements for chasing bugs, mice and birds. Domestic outdoor cats can be often found stalking and chasing the real things. Often, they may make their way through the owner’s home with a mouse or dead bird in their mouth. In the feline language, giving up their prey for their owner, is the ultimate gift of love. This gift though is often not appreciated, as the owner will very likely chase the cat out and scold it for being naughty. While nothing can really be done to teach a cat not to be a predator, some things can done to lessen the predatory drive. A hungry cat is generally more prone to hunt for a meal. For this very reason, cats whose jobs were to catch mice in barns were left to starve in order to do better do their job. 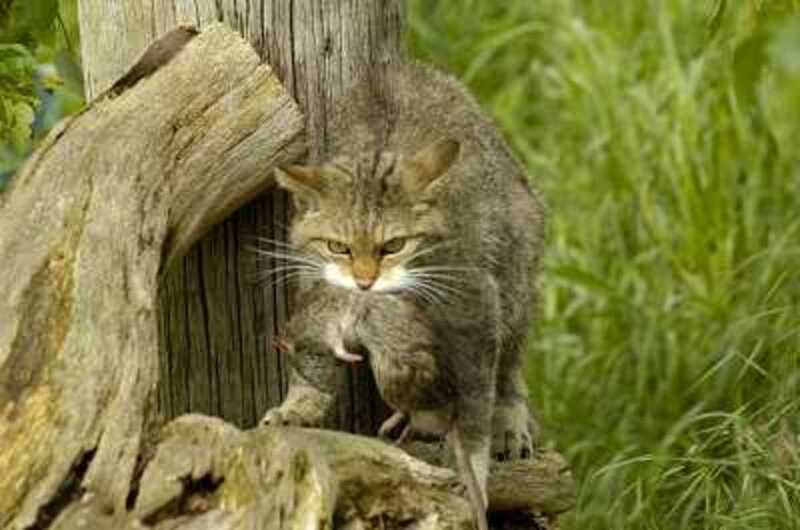 A starved cat has two reasons to hunt: for a meal and for the fun of it. So if your cat has a nice full tummy the motivation may be lowered a bit, but the cat will still have a kick out of it. Another good way to decrease predatory drive is to provide lots of exercise for your cat. If your cat likes to chase your feet and bite your ankles you want to redirect that predatory drive towards something more acceptable. Next time, try to toss a ball and praise your cat for playing with it. Provide lots of stimulation by giving toys, and lots of things to do. A tired kitten is often a well behaved kitten. Teaching a cat not to be a predator is like teaching a child not to play. It is an instinct and unlike play in a child, a cat’s predatory drive is also linked to its survival. We cannot change the genetic make up of a cat but we can teach them good manners and rejoice of all the adorable feline features they are equipped with.